Unfinished 9m wide tunnels and completed habitat with Compressed Regolith Block walls. 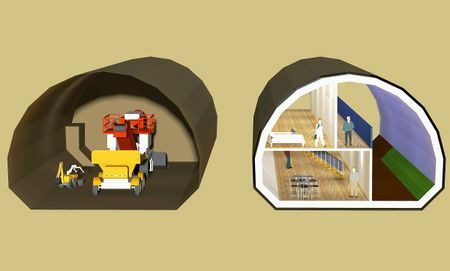 Drilling an artificial cave, or tunnel habitat, is a concept to create room for an artificial habitat. If no usable natural caves are found an artificial tunnel can be drilled into a rock mountain. The walls of the tunnel must probably be stabilized. For automated construction, the usage of segmented rings or arch segments can be considered, made from sintered regolith or concrete. Sprayed foam could also be used to stabilize the walls. For example, a tunnel with a diameter of 5 meters is drilled. The stabilization reduces the diameter to 4 meters. Thermal insulation leads to another reduction to approx. 3 meters, or a little larger for better insulation materials. With such a tunnel of 1 km length it should be possible to build an underground greenhouse to feed 10 people. Though the drilling requires a high sophisticated digging machine this concept allows the creation of virtually unlimited room with best protection against radiation and meteorites. Once the drill is in place the process is continual and easy to be remote controlled and is, therefore, considered to be part of the unmanned setup of a whole settlement. 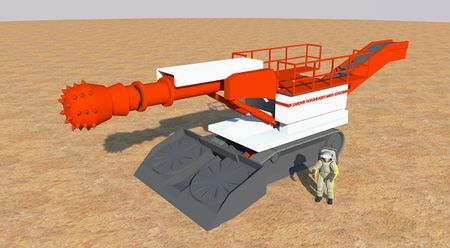 It is also possible to use a roadheader type of machine to dig a non circular tunnel of larger diameter that might provide a more habitable shape. Roadheaders and tunnel boring machines can reach production levels of 30m3 per hour and more, depending on a large number of variable such as stone hardness and stone quality. A single unit may be capable of digging out 60 000 m3 per year or better. The Boring Company of Elon Musk has been created to improve the performance of boring machines, and any progress made might be applicable to MArs to obtain higher productivity. Extra material from the tunnel habitat may be used to prepare surface elements of a Mars settlement. Depending on the excavated rock, sintered regolith or Compressed Regolith Blocks might be prepared for construction purposes. Or the excavated material could simply be usef for landfill and road preparation. This page was last edited on 9 April 2019, at 17:04.